Earlier this week, Mr Chiots had to travel, so I needed a quick meal to whip up the night before that would be good for him to eat cold the next day. What’s better cold than pizza? I didn’t have time to make dough for the crust, so I used a sourdough caibatta that I had in the freezer. I cut the bread in half, smeared the cut sides with roasted tomato passata and loaded it up with vegetables: homemade olives, caramelized homegrown onions, sun dried homegrown tomatoes and completed it with a good measure of local raw milk cheese. Into the oven it went for a few minutes to melt the cheese to hold everything together. I sent half of it with him and kept the other half for my own dinner. He enjoyed his cold while on the road, while I warmed mine in the oven for a few minutes. 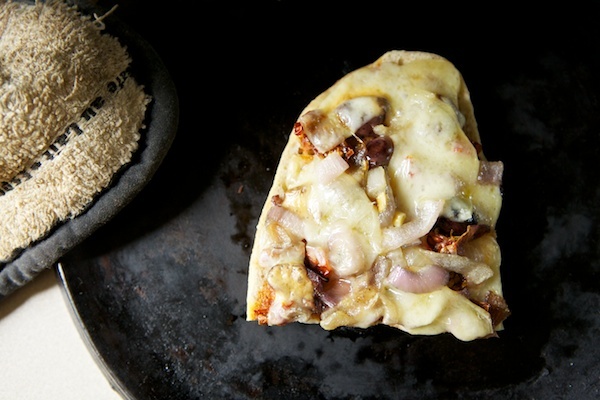 Pizza can be a healthy meal if you use sourdough crust and load it up with lots of healthy toppings. It’s also a great traveling food because it’s almost just as good cold as it is warmed up. Everything! Never met a topping I did not like. Barbeque pizza is pretty outrageous though. YUM! Yum… sounds & looks delish!! Hmn.. My favorite pizza toppings is sausage.. love olives, onions & mushrooms too.. Yum!